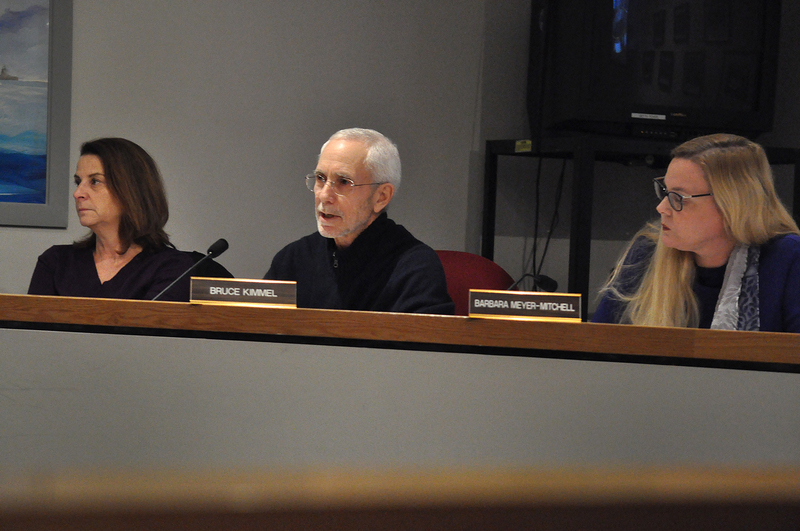 From left, Norwalk Board of Education members Heidi Keyes, Bruce Kimmel and Barbara Meyer-Mitchell discuss the Norwalk Public Schools 2018-19 operating budget, Tuesday in City Hall. NORWALK, Conn. – Funding for later school start times has been removed from the 2019-20 Norwalk Public Schools operating budget request. Eliminating that $732,056 line item and shifting some items to the capital budget make the NPS budget request $202,184,484, or nearly $11.7 million more than what the Common Council approved as funding for NPS in 2018-19, a 6.1 percent increase. Finance Committee Chairman Bryan Meek on Tuesday characterized the requested increase as $9.8 million, or 5.1 percent. The Board’s Special Education fund, created to ramp up in-district services for students with special needs, is sunsetting after three years, with fanfare about its success. Out of district placements are down from 137 in 2015-16 to 84 in 2018-19, Chief of Specialized Learning and Student Services Yvette Goorevitch said in a presentation to the Board. “Healthier High School Start Time,” or “budget goal #7,” was also removed, a $732,056 reduction. Science has shown that early high school start times are a health risk for students, Adamowski said in November, announcing that a committee had been formed to study the issue. “Given the Committee was still working and didn’t have a number on a budget that we could use for start times, we agreed within the (Finance) Committee to defer that to 20-21,” Kimmel said Tuesday. The committee still needs to obtain feedback from students and from a community survey, she said. “I am of course disappointed about the delay partially because, you know, the timing would then be we have a new superintendent to administer the change and that is a tough issue to come into as a new person,” Board member Barbara Meyer-Mitchell said. Board member Erik Anderson said he supports later high school start times, but not now. Former Board Chairman Mike Lyons likened the spending, including the SpEd fund,” to the “surge” definition used by the military, a “short-term increase in spending.” Adamowski had, in his first Board retreat, told members that an incremental approach wouldn’t work on improving an urban school district with a “huge achievement gap,” he said. “You have had the big surge in funding to fix a lot of the things that were not working and from that point on, you can reach something of a steady state,” Lyons said, recounting his time on the Board of Estimate and Taxation, when the Board of Education would ask for more money without a plan to back it up. Why isn’t the BOE concerned with Norwalk’s declining property values and exodus of long time homeowners replaced by renters not paying their full share of the education budget ? Was the BOE elected to match school salaries with surrounding wealthy towns ? Or acknowledge the genuine concerns of taxpayers of providing affordable public education. City homeowners have lost billions in potential property appreciation under punitive property taxes require to support school budgets well in excess of what the community can afford. Relatively few public school teachers live in Norwalk citing very high property taxes and school issues. That ought suggest to the BOE its overspending our underperforming schools. Especially when less than half our graduates secure college degrees and few take advanced placements. Increasingly it looks like the main beneficiaries of our City’s public school system are its school teachers/administrators whose pay is divorced from student achievement. Unless rectified that’s a strategy for a Bridgeport solution. “It’s asking for more money so we can complete carrying out a strategic plan which already has established Norwalk as the highest performing urban school system in the state”. Where is the evidence for this claim? According to the state’s Accounability Index, we are currently the highest performing urban district in the state. For once something was tabled instead of being shoved through like the middle school redesign. More input from all stakeholders is how it should be for any changes in the district. The proposed increase in school funding is not within the financial means of the every day tax payer. I would urge the BOE to take a step back and understand the unintended consequences that continued material increase in the mill rates will have on the long-term viability of Norwalk. Further, with a majority of homeowners not matriculating students in the city, the BOE is adding unintended fuel to the fire of the continued exit of long-term residents. What I see is that The Board of Ed. has worked tirelessly and made some truly great achievements. We should thank them individually for their service. Educator’s work really hard. The teacher’s I know are really focused true professional’s who give it their all. What is missing in this discussion is Parental Involvement. If it’s true “High need student’s in Norwalk 61% Vs. 17% in surrounding communities” we need these parent’s to be much more engaged in their children’s education. Years ago I had the pleasure of working with The Yerwood Center in Stamford Ct. Donovan Beckford was the Director. They had a 97% High School graduation rate. I asked Donovan what his secret sauce is and he said ” That’s easy…when your child get’s accepted at Yerwood parent’s agree they must attend a program on how to do homework with your child. If we start in Kindergarten, First, second grade that makes a big difference for later year’s. Let’s continue the discussion on Parental responsibility to assure student success. The Board of Ed. works tirelessly .The Teachers give it their all and the tax payers have gone above and beyond as well. We don’t have a failure to educate. We have a failure to parent. Let’s not bankrupt ourselves until we fix this first.